** N.B. 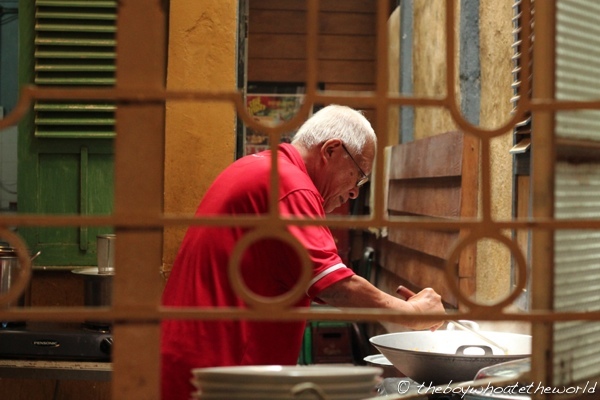 Since writing this post, Uncle John has since moved to a new venture, LimaPulo on Jalan Doraisamy where you’ll be able to find his signature Curry Laksa and other Nyonya classics. A decent Malaysian Nyonya restaurant is hard to find these days (yes, even in Malaysia believe it or not). The best Baba-Nyonya food is still almost always home-cooked, found at the family dinner tables of old school Peranakan cooks. And there aren’t many of them left. Hence, I was intrigued to hear glowing reviews from my mom about a new Nyonya restaurant in the heart of KL where her friend John has been at the helm of the kitchen since it opened its doors in early 2013. Now, if that’s not a true, old school Baba-Nyonya at work, I don’t know what is. The Executive Chef at Limablas, Uncle John also happens to be the husband of Florence Tan – one of Malaysia’s most celebrated Nyonya chefs whose recipe books I’ve been referring to for many years now. As we walked into the restaurant, we found John personally frying up a chilli paste for a curry that my mom had specially asked him to cook up. And if he’s not attending to his signature Nyonya spice pastes in the kitchen, you’re likely to find him pacing around the restaurant, taking orders and hosting what has become a growing hoard of loyal customers. But it’s not just the wonderful aromas of Laksa and curries wafting onto Jalan Mesui that have kept the crowds coming back. It’s hard not to love the vintage design and carefully curated antiques throughout which range from retro bicycles and payslip typewriters to age-old flour bags and shop signs. All these little details come together to create a nostalgia-fueled flashback to the Malaccan shophouses of old. 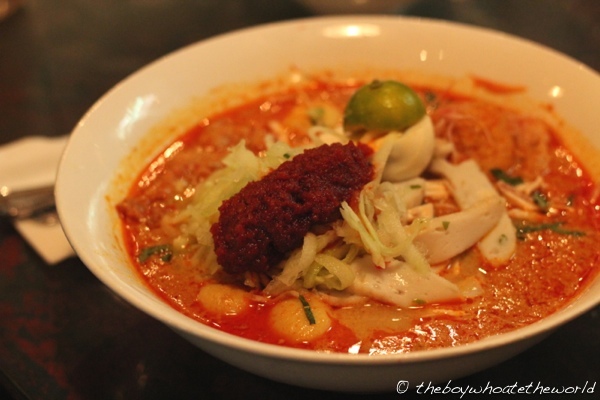 I started with a humungous bowl of their signature Malacca-style Nyonya Curry Laksa. Although I’m partial to the tangier Penang Assam version, this was a properly hearty bowl of Laksa that I’d be happy to take down any day of the week. I find most Curry Laksas overly rich and creamy from the buckets of coconut milk that are often added to the spice broth. The broth here at Limablas is wonderfully balanced and subtle with a large dollop of chilli paste served separately on top which allows diners to customise the spice level and depth of flavour of their individual bowls. Fully loaded with noodles, poached chicken, fish balls and deep-fried bean curd, it’s an absolute steal at RM9.90 a bowl. I hear Uncle John only makes 17 bowls of Laksa every other day (available Mondays, Wednesdays and Friday lunchtimes only) so get there early or call ahead. It’s no wonder the first question most concerned customers ask when they walk through the doors is “Uncle, any Laksa left?”. With 6 of us in our group, we had the opportunity to order a full spread of their other Nyonya dishes to sample. My mom had purposely called ahead to ask John to cook up her favourite Pineapple and Prawn Curry (available only if pre-ordered as it’s an off-the-menu item). The jumbo prawns they ordered in for the dish were super succulent and you could taste every layer of the complexed, full-bodied curry paste from the lemongrass to the chillies to the pineapple. My only quibble with the dish was that I found it a wee bit too sweet for my liking. We also sampled a slew of their signature Chicken dishes: ‘Ayam Pongteh’ (Nyonya Chicken and Potato Stew), ‘Ayam Sioh‘ (Tamarind Chicken) and their Nyonya curry chicken – all staples of Malaccan Nyonya cuisine. The Pongteh stew was deliciously moreish and comforting.I found myself lapping up spoonful after spoonful of the savoury and sweet gravy with rice. Ayam Sioh was equally as tasty. I’ve never been a fan of it in the past as I find the combination of tamarind, fermented soy bean and dark soy a bit odd. The balance of the dish here however is a different story altogether. The sour and savoury elements of the Sioh gravy are completely transformed when it is caramelised with shallots and sugar to just the right level, giving the chicken a sweet and almost smoky overtone. Sadly, their Nyonya curry chicken was less impressive. 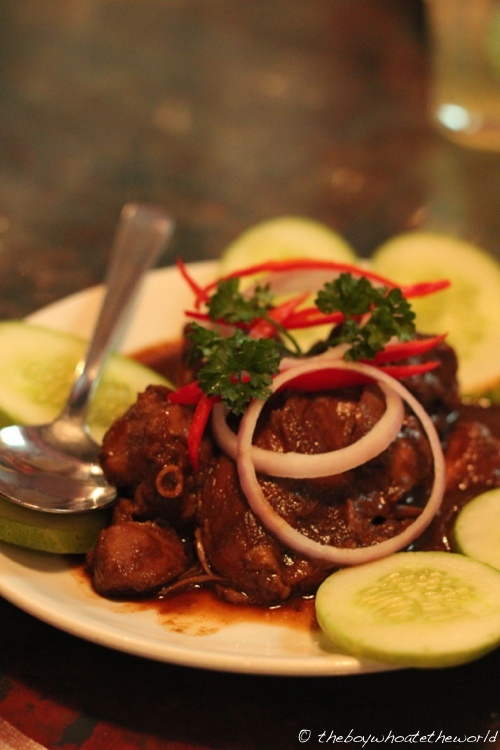 When I think a Nyonya chicken curry, I think of the thicker, ‘Kapitan’ style curries which hail from the North. I was a bit disappointed with the Southern version they do here which was watery and lacking in flavour. 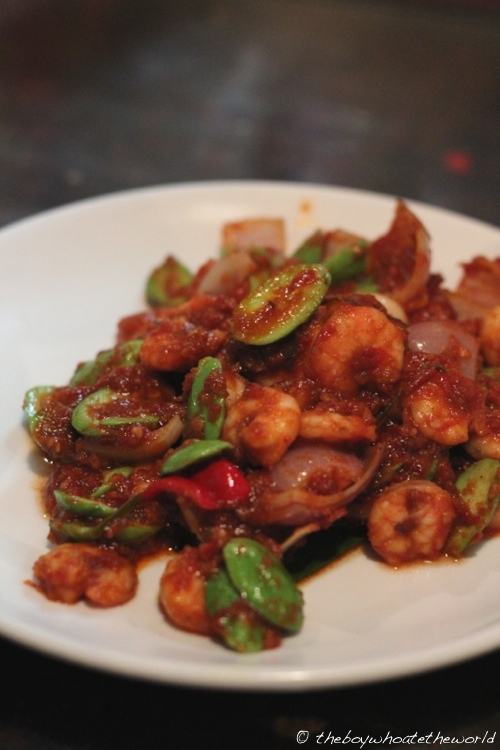 Of all the dishes we sampled, it was their Sambal Udang Petai (spicy ‘stink’ beans with shrimp) which stood head and shoulders above the rest. The pungent smell and flavour of petai isn’t for everyone and I myself sometimes find it can be a bit overbearing. 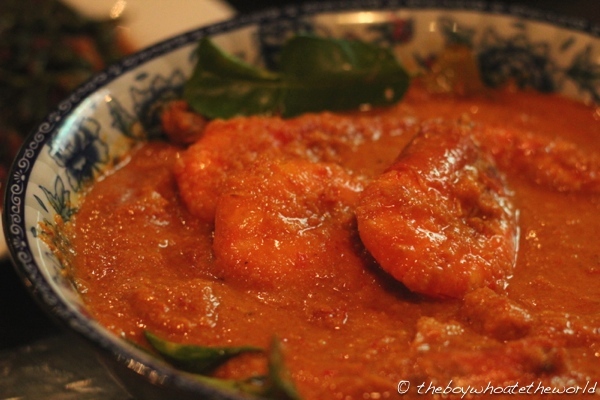 However, when it’s paired with a killer sambal like they do here and sweet, juicy prawns, it’s a dish with a flavour profile like no other. Easily one of the best Sambal Petais I’ve ever tasted. Tummies bursting with all things Nyonya by now, we summoned up what little space we had left for their Cendol. 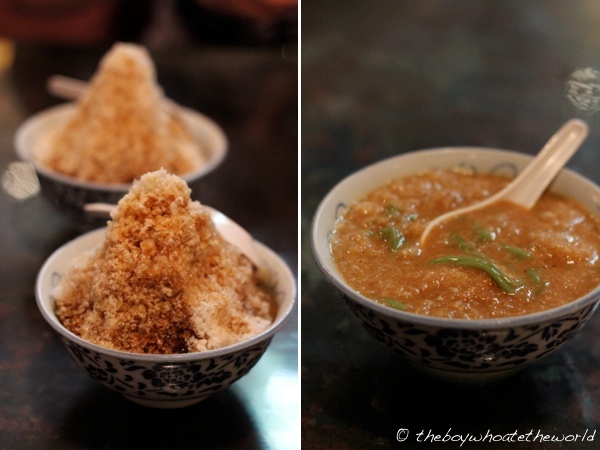 I’ve definitely had better Cendols at my favourite street stalls in Penang, but the use of top notch Gula Melaka (palm sugar) in this shaved-ice favourite still made for a refreshing end to our feast. On the whole, a highly impressive meal that was made even better by Uncle John’s hospitality and the incredible, old world ambience. With lunch specials priced at RM9.90 and smaller-sized main dishes starting at RM12, it’s all fabulous value by KL standards, especially when you take into account the large number of ingredients and time intensiveness that goes into the preparation of authentic Nyonya cuisine. Definitely one of the gastronomic highlights of my trip back home this time around. Kudos to the Limablas team for bringing Nyonya food back into fashion and making it accessible to KL folks. Bring on the Nyonya food revival I say. YUMMMMMMMMMYYYYYYY! I want to try! Looks amazing! @Wendy: Highlight of my trip back so far. Worth a visit if u’re ever in KL – i think you’ll love the deco of the place as well! @KW: Yes, have heard Tranquerah designed by the same team behind 15? Will give it a try next time I’m back in town – tx for the tip! Uncle John has moved to LimaPuloh located behind Sheraton Imperial.